Yes, I'm guilty of taking a month and a bit break from doing anything other than bed/movies/books/coffee/shopping etc. I treated myself to some r&r, not that my life is overly strenuous or hard, I mean I get it pretty easy but I figured I'm only going to be in uni/real life limbo once in my life I may as well live it up the best I can. So I just decided to stop doing anything that used up too much energy. And here we are now, a month an a half down the track and I'm getting back into the swing of things. I've noticed a few massive changes in my life as i'm slowing become more "mature" or what ever you call that step between 'no longer mooching too much off parents' and 'finally moving out of home and making a name for myself'. My style is slowing developing into nothing but blacks/whites/greys/fauxfur/leopardprint/cream and my love for all things ridiculously expensive is finally rearing it's well groomed, immaculate head. I sit in bed and think of ways that I can get money really quickly without having to put in much effort at all and it doesn't make sense to me that I don't have much of it in my life. Then I take a look at my bank statements and see that my social life and impulse buying is really taking its toll on the likely hood of me welcoming a Givenchy or Celine into my life. Then I kind of just slump back into my pillows and agree that tomorrow morning i'll work harder to build a savings and I go to bed happy with how determined I am. Mind you i've be telling myself that for the last month and a half and i'm still poor and surprise surprise- no Celine. 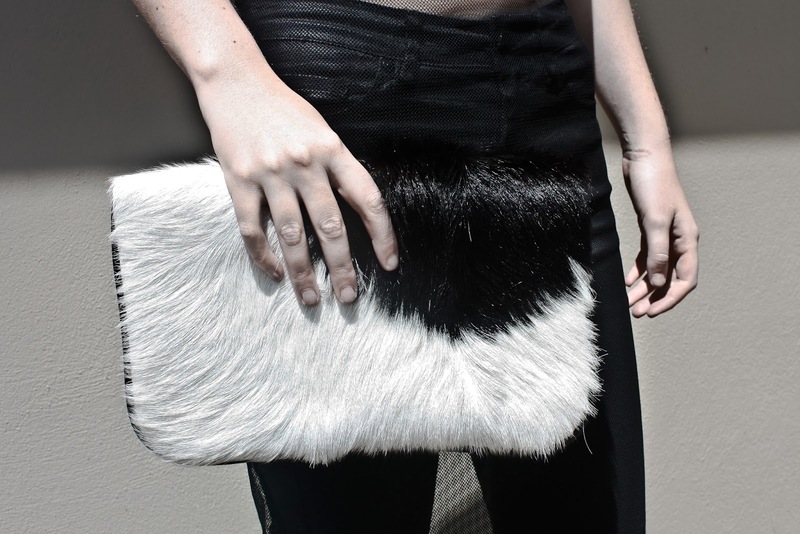 The fur clutch i'm grasping is a new favourite. It ticks the black/white/fur columns and I didn't impulse buy. I actually told myself I didn't need it, brought a new wallet drove all the way home from the city, got home and had a shoppers anxiety that I just missed out on what could be the best clutch i've ever owned. So i phoned my friend, told him I needed it, transferred the money, pressured him to buyYes, I'm guilty of taking a month and a bit break from doing anything other than bed/movies/books/coffee/shopping etc. I treated myself to some r&r, not that my life is overly strenuous or hard, I mean I get it pretty easy but I figured I'm only going to be in uni/real life limbo once in my life I may as well live it up the best I can. So I just decided to stop doing anything that used up too much energy. sometimes it is good to take a break, looking good!